First Channel states that the key points of this evaluation system are social and economic indicators (in particular regional investments), election outcomes (such as voter turnout), the level of trust Putin has in the governor, and incidents of corruption involving the governor or his relatives. Further, gubernatorial candidates are selected by the Kremlin (for those regions with governors approved by the local legislatures) who are “young, energetic leaders with experience.” The newly appointed governors of Perm region and Buryatia are 36 and 40 years old, respectively. Business and public qualities of the candidates are thoroughly evaluated through computer testing and interviews the channel stated. First Channel reports that “a star diplomat of international scale, Ambassador of Russia to the United Nations, Vitaly Churkin died in his workplace a day before his 65th birthday.” President Putin posthumously awarded Vitaly Churkin with the Order of Courage. Churkin was buried in the Troekurovskoe Cemetery of Moscow with full military honors – the Russian hymn was playing, accompanied with three shots fired in salute. First Channel reports that Russia will construct the second stage of a 12-billion-euro nuclear power station in the Hungarian city of Paks. Other Russia-Hungary cooperation includes a new factory producing food additives for cattle and poultry, which has been opened in Tula region by Hungarian businessmen. First Channel stressed that Hungarian Prime Minister Viktor Orban has a negative position in relation to the sanctions imposed on Russia, and favors the bilateral cooperation. Russia Channel reports that the Russian military started testing new weapons and special equipment in the Arctic region, running them on a 2,000 kilometer testing route from the settlement of Tixi in Yakutia to Kotelny Island and back. This is part of Russia’s Arctic area military buildup as part of the North Strategic Command, established in 2014. The new equipment includes different types of all-terrain vehicles and automobiles. First Channel reports about a widespread scheme when apartment buildings are constructed illegally, without proper government authorizations, and then apartments are sold to people who later end up having legal problems, including the risk of losing their residences. There are numerous criminal schemes related to apartments, for example, swindlers illegally change a registration in the ownership for apartments of people who passed away, and then resell those apartments. Such transactions are usually conducted with the help of corrupt government officials, the channel says. First Channel reports a new system for tracing government expenditures, known as the “Electronic Budget” will be operational by 2020. It will enable citizens to see how taxpayers’ money is spent. This system is one of many digital technologies being developed in Russia, the channel continued. Other examples are new bank cards, new generation passports and other electronic documents, and other projects. First Channel quoted Prime Minister Medvedev as saying that developing such domestic IT technologies is part of maintaining Russia’s sovereignty and national security. First Channel reports that during the four-day holiday of February 23-26, Russians preferred to go to museum art exhibitions. Some people practiced sports, for example, they participated in skiing competitions. Many people took part in open-air events, such as contests and performances devoted to the ancient Russian holiday of Maslentisa. 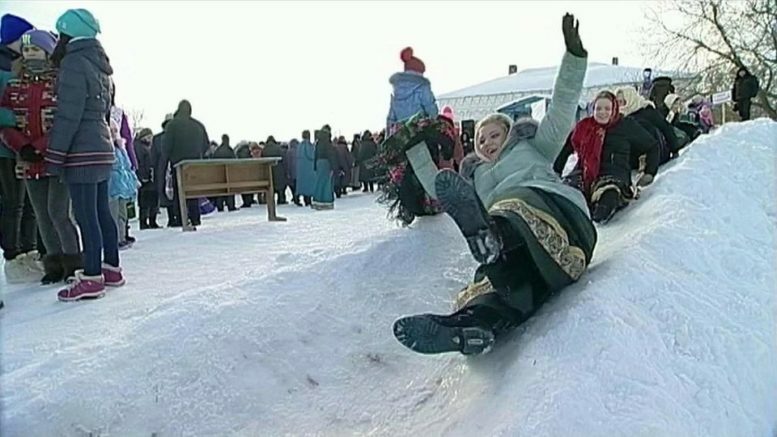 According to First Channel, ten years ago Russians preferred to go to malls at weekends and holidays, while nowadays they opt for more diverse and healthy activities.